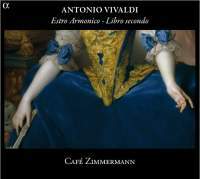 This disc is labelled ‘Libro secondo’, even though so far there has been no ‘Libro primo’; the reference, however, is not to the CD but to the two fascicles of the original 1711 publication of Vivaldi’s first, freshest and most influential set of concertos. This, in other words, is a recording of Vivaldi’s Op 3 Nos 6-12. And anyway, the idea of issuing a recording of the 12 concertos in two volumes is a nice one, less overwhelming than releasing them in one go, and offering listeners a better chance of getting to know the individual works. The concertos here include the two best-known – No 11 for two violins and cello and No 10 for four violins – while five of them are also known as sources for keyboard transcriptions by Bach. Café Zimmermann are somewhat gentler with them than those who adopt the drivingly projected style popular these days. In this they make a pleasant change, though some listeners may think they lack spark in certain places, such as the violin duel that opens No 11 or the superimposed arpeggios passage in No 10. Yet elsewhere subtleties are released: the more relaxed approach certainly suits the Corellian textures of No 7 and there is a rich easedown at the end of No 11’s fugue. The sound, too, is clean, warm and present, with some sweet lyrical tones coming from the violin of Pablo Valetti, the director and principal soloist among a quartet of lucky violinists playing on Guadagnini originals. If overall these performances are without the joyous celebratory feel of Tafelmusik’s single-disc selection of eight concertos (Analekta, 2/08), they are nevertheless good company and ultimately probably easier to live with than the inspired quirks of Europa Galante (Virgin, 9/98). Yet interestingly, it is in the two non-Op 3 works – RV414 and RV544, both featuring the suave solo celloplaying of Petr Skalka – that the greatest energy is found.